"I'm very outdoors. I like parks and nature. I like gardening. I like animals. I like normal stuff not having anything to do with the industry," VASSY told me with an affectionate laugh. Vassy Karagiorgos, known to the EDM universe as VASSY, has been making a gigantic splash on airwaves all over the world. The Australian vocalist made history when "We Are Young" reached number 1 on the US Billboard Dance Charts making her the first Australian Artist to go number 1 with her solo single debut release. 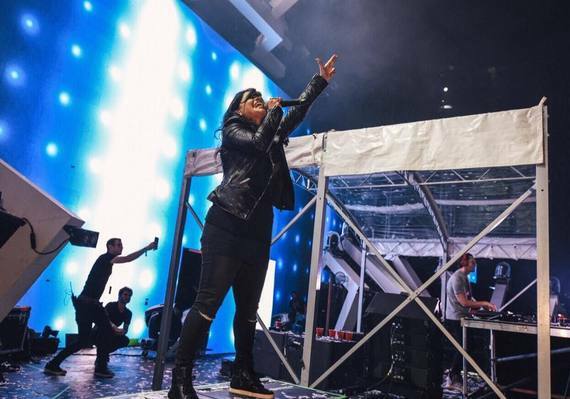 Despite establishing herself as the queen of the dance floor, VASSY had to scratch and claw her way to the top of the charts while growing up in Australia. In an exclusive interview with the Huffington Post, VASSY described what it was like growing up in the Land Down Under. "I grew up in Darwin, Australia. That's a remote part of Australia. I was up in the tropics where they shot Crocodile Dundee and all that stuff. It was a very beautiful place--very tropical. But it was a difficult place to grow up in because there wasn't really a lot of opportunity," VASSY told me. She explained, "It wasn't like growing up in Sydney or Melbourne. It was tough - I was told I couldn't sing and didn't have the chops. I wasn't exposed to too much up there. It was a beautiful place to grow up in as a kid being outdoors all of the time. I think that's why I love the outdoors in general. My career started later on. I studied architecture in Sydney. Australia is a really unique place to grow up in. It's special having that but sometimes I see what it's like for people growing up in the States and being exposed to so much more." VASSY soon found herself exposed to the electric dance music scene which helped put her on the map. She played a wide variety of different festivals. When talking about her experience playing Electric Zoo this past September, she told me, "It was awesome. I hadn't done Electric Zoo before so I was looking forward to performing in front of a New York crowd. I've done big festivals like Tomorrowland and Ultra. But I think it was cool because it was a true, local New York crowd. When I came out the energy of the crowd was off the hook." Another off the hook memory for VASSY included her performance at Ultra. She said with a smile, "I think Ultra was a really special one because of the time of day that we played. We played sunset time which is a magical hour. That's my favorite time of the day, period. I came out performing during the sunset time and it was awesome. Not only that, we played right near the ocean! Every time I come out to perform whether it be a club or a big festival, the energy is always so great. The lights on the stage. You enjoy the experience just as much as the other. You feed off the crowd." The crowds can't get enough of VASSY. Her collaborations with David Guetta and Tiësto solidified her as the go-to vocalist for the gigantic dance anthems. When recalling her experience working on the song "BAD" with David Guetta, VASSY told me, "It was awesome. It still does well, it is so crazy. It went double platinum. We are talking about doing another one--we just kind of have to find the right sound. And then a year later to have a double platinum record with Tiësto . These guys have been around for a long time and have a big following. It is such a big platform when these guys are able to DJ for two decades. A DJ has such a cool job because they play everywhere and play everyone's songs. So you have more access to crowds. It's been really cool. I've been embraced really well by all the fans. They support everything I do which is really sweet." The fans have welcomed VASSY with open arms because of her unique voice. VASSY dared to find a different sound after listening to one of the best singers in music history. VASSY told me, "I was very inspired by Billie Holiday. She was the first vocalist that got me interested in singing when I had discovered her at sixteen. I fell in love with her voice and I fell in love with the idea of moving to America one day when I heard that song 'Autumn in New York.' She was the main person that really got me thinking about being a singer. I love Crystal Waters too--we've become friends. She inspired me. I really like people with more unusual voices. I play with my voice. I have three different sounds to my voice. Depending on the record, I just go wherever it needs to be. That's the fun thing about being an artist. On some records you sing out more. On one record with Benny Benassi, I'm really singing and belting on that. It's a beautiful record. On other songs I play around with cool pitch stuff. On other records I'm a bit more sassy and have more of an island feel. I just like to do what's right for the song." Her unique vocal ability has landed her songs in a variety of different projects. VASSY told me some of her favorites. "It was really cool when Disney's Frozen wanted to use my song as a trailer song. They won an Oscar. Then Tina Fey's film...then Kevin Hart. It's really cool for my music to be in these movies and trailers. Campaigns like Victoria's Secret. TV shows like Grey's Anatomy. There's also a whole other side of me that's more indie that I think that tends to work well. Who would have known? It is kind of a fluke how everything has come together." What's no fluke is VASSY's dedication to her charity work. "I've helped out with a lot of humanitarian causes. That's something I'm very passionate about. I've done it throughout the years. Always helping out causes and trying to donate my time," she told me. VASSY then explained why she was very much involved in the The NOH8 Campaign. VASSY said, "The NOH8 Campaign in particular is anti-discrimination. It predominantly focuses on the gay community but it can include everyone really. It is really about accepting people for who they are. You don't have to like what they do but it's not your life. You have choices in your life and what you want to do but you have to respect people's differences. That's it really. It is about increasing awareness and trying to diminish ignorance. Just education really...It is to let people know that you may not understand the way a person lives or like it--The transgender community in particular. I see so many cruel people be like, 'they're fucked up.' No. It's not your life. Respect them. You don't understand what they are going through or why they think that way. Have respect for people...That's what it is about." VASSY has also donated her time working at an orphanage. She explained, "I was working at an orphanage for teenage girls. I was volunteering for two years teaching my music workshops. I liked doing it. I liked giving back. I was able to do it at that time. I wanted to motivate the girls and inspire them and make them feel good about themselves. I learned a lot through the process. I know that I am good at connecting with youth and making them feel empowered. That's why I did it. The most important thing was to show up. By showing up every week you proved to the kids that someone actually really cares. They were abandoned. As long as you can be committed then you can make a difference. And keep your word. I did it for two years." Being a motivated and focused person, VASSY plans on giving fans more music for many years to come. She said with a wide grin, "I want to continue to make great records and do my own thing. I want to continue to perform for fans and make great music for everyone. That's the ultimate goal and have a lot of success at it really. For now it's really about the music. I want to have another hit record. Feeling good about giving the fans great music." She stressed how much the fans meant to her. Before departing, VASSY told me, "I really love the fans. I'm here to hopefully encourage them to fight for their dreams. I love what I do and I love that the fans are there with me. I want more people to connect with me. As long as I am able to make them feel good and remind them that they can chase their dreams too. All things are possible." You can learn more about VASSY by following her on Facebook, Twitter and Instagram. You can learn more about the NOH8 Campaign by clicking here.